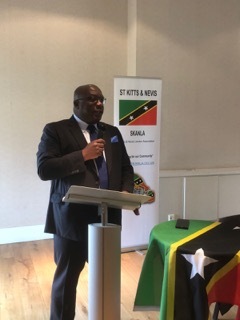 BASSETERRE, St. Kitts, April 15, 2018 (Press Unit in the Office of the Prime Minister) – More than 200 nationals living throughout London, England attended an important town hall meeting with St. Kitts and Nevis’ Prime Minister, Dr. the Honourable Timothy Harris and Premier of Nevis, the Honourable Mark Brantley, who is also Minister of Foreign Affairs. 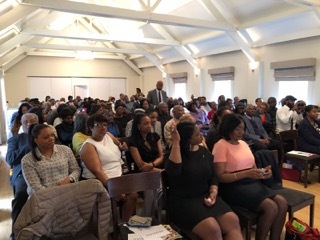 The two leaders within the Team Unity administration received a warm welcoming reception at the meeting, which was held earlier today (Sunday, April 15) at Stoke Place, Stoke Green, Slough SL2 4HT. The Kittitians and Nevisians living abroad were updated on the stewardship of the government since it assumed office in 2015. During his presentation, Prime Minister Harris gave a detailed overview of his recent trip to the United Arab Emirates (UAE) and Hong Kong where he discussed the various new features and options now available under the country’s Citizenship by Investent (CBI) Programme with a large number of international marketing agents and partners. Dr. Harris, who serves as Minister of Finance, also advised those in attendance of the near five percent economic growth rate being predicted for St. Kitts and Nevis in 2018. This he said is being driven by a robust construction sector. The honourable prime minister further reported on the pace at which capital projects are being implemented so far in 2018, including the construction of the new Tabernacle Health Centre, work on the Coast Guard Unit base at Bird Rock and the relocation of the Public Works Department’s (PWD) Vehicle Maintenance Division to the compound of the St. Kitts Sugar Manufacturing Corporation (SSMC) at Kittsodart, which will pave the way for start of work on the East Line Bus Terminal. Other developments expected to commence shortly in St. Kitts and Nevis include the second cruise pier at Port Zante and the roll out of the island main road rehabilitation project, which will see five small local contractors participating during its first phase. Prime Minister Harris also spoke of the importance of love for country and a deep sense of patriotism, and in that vein, the St. Kitts and Nevis Prime Minister encouraged the nationals living abroad to be active participants in the socio-economic life of their homeland. Sunday’s town hall meeting was held as a precursor to the 2018 Commonwealth Heads of Government Meeting (CHOGM), which will be held in London from 16th-20th April. Accompanying Prime Minister Harris and Premier Brantley at the Heads of Government meeting are Cabinet Secretary, Mrs. Josephine Huggins; Permanent Secretary in the Ministry of Foreign Affairs, Ms. Kaye Bass; Permanent Secretary in the Office of the Prime Minister, Mr. Andrew Skerritt; and St. Kitts and Nevis High Commissioner to the UK, His Excellency Dr. Kevin Isaac.